In the wake of the Parkland, Florida, school shooting, Republicans are claiming that the easy availability of guns in the U.S. isn’t even a factor in our national epidemic of mass shootings. Instead they point to mental illness as the only factor that should be considered. Republicans’ strategy of trying to divert our attention from the real problem — guns — isn’t new. Tobacco companies used this same “bait-and-switch” strategy for decades with great success, and corporations have since passed the strategy down to their lackeys — Republicans — who are still using it today. In the 1980s, tobacco companies successfully shifted Americans’ focus away from another rampant deadly problem: the high rate at which kids were taking up smoking. Cigarette company advertising had long targeted youth, and in response health advocates started seeking restrictions on cigarette marketing and advertising and new laws requiring retailers to keep cigarettes out of the reach of kids in stores. To counter this national push, cigarette makers rolled out “youth smoking prevention” (YSP) programs. It was an ingenious maneuver. YSP programs took the focus off cigarette companies’ marketing practices and portrayed the companies as the solution rather than the problem. These programs allowed the company to shift the blame for youth smoking onto parents and kids, and gave lawmakers cover to vote against bills to regulate cigarette marketing. As voters clamored for more regulation on cigarette companies, legislators simply pointed to cigarette makers’ YSP programs and claimed these programs took care of the problem. The companies were pouring millions of dollars into these youth anti-smoking programs, so legislation was unnecessary, they said. But years later, cigarette company internal documents revealed that cigarette makers measured the effectiveness of their “youth smoking prevention” programs by how well they helped forestall legislation regulating cigarette marketing, not by how well they reduced youth smoking. These programs were highly effective at forestalling legislation, and people fell for this bait-and-switch effort for over two decades. Because it was so effective, cigarette makers used the strategy over and over. They shifted the focus away from secondhand smoke causing disease by portraying the problem as a “smokers’ rights” issue. They secretly funded “smokers’ rights” groups and paid groups of scientists, like Associates for Research into the Science of Enjoyment (ARISE), who toured the world making public pronouncements about how smoking provides a release from everyday stresses, just like shopping, eating chocolate and drinking tea. It was absurd, but people fell for it, hook, line and sinker. Don’t fall for it again. Now, Republican politicians like Senator Marco Rubio of Florida are Sen. Joni Ernst of Iowa using exactly this same bait-and-switch strategy. “It’s not the obvious thing that’s the problem, it’s something else,” they insist. After every gun massacre, they insist the problem isn’t guns, but mental illness, and that’s all. It’s simplistic, counterintuitive and utterly incorrect. Corporations use this switcheroo strategy to take the focus off the deaths their products are causing and divert attention from the way their products and marketing practices are literally killing thousands of Americans every year. The gun manufacturers now face exactly the same problem cigarette makers faced two decades ago. Don’t get suckered by gun proponents’ efforts to make you look away from the real source of the problem. Always keep your focus on the one real problem at the root of America’s gun massacre epidemic: there are too many guns in too many hands. It’s NOT about mental illness. 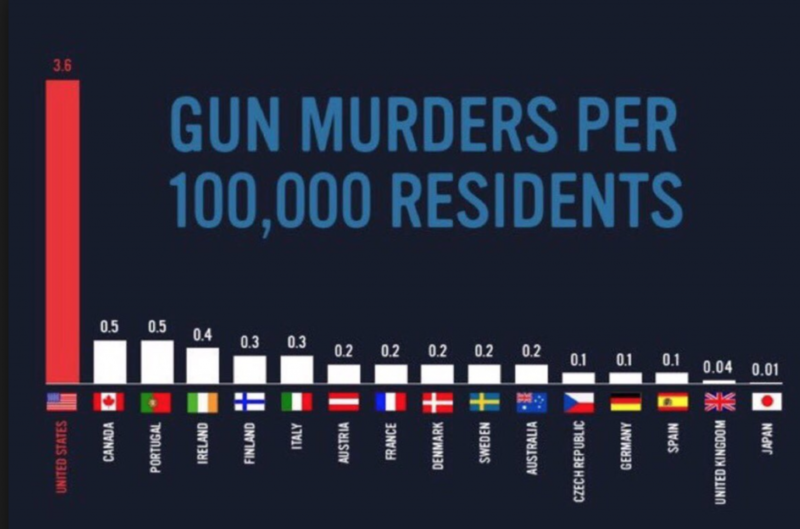 All countries have their share of disaffected, angry and mentally disturbed young men and women, but NO country has the sky-high number of public gun massacres that we have here in the U.S.. 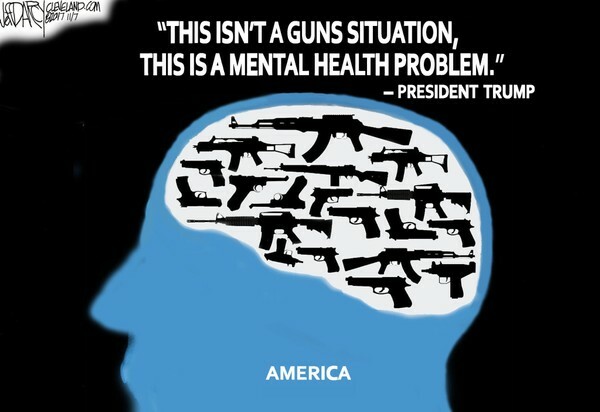 If the problem was only attributable to mental illness, then countries with rates of mental illness similar to the U.S. would have the same super-high levels of firearm deaths as the U.S.
Pro-gun politicians and the National Rifle Association — the gun manufacturers’s lobbying group — are now trying to divert our attention away from guns as the problem exactly the way the tobacco companies worked to take the focus off cigarettes as a cause of disease and addiction in the 1980s and 1990s — by shifting our focus away from exactly those policy changes that taken together would make the biggest dent in the problem. Of course the answer is NOT more guns. President Trump and other Republicans are trying to convince Americans the answer to mass shootings in our country is to arm teachers and school administrators. They want to add more guns, claiming if potential shooters know they risk getting killed by shooting up a school, it will be a deterrent. The argument fails to consider that most rampage shooters kill themselves before police even get to them. Moreover, what about gun massacres in grocery stores, theaters, at concerts, in workplaces and shopping malls? The arm-the-teachers strategy would do absolutely nothing for those situations, nor does having more guns in the mix assure that gun massacres will be prevented. The add-more-guns strategy is defensive, not proactive, at a time we need proactive answers to the problem of gun massacres. This strategy also has no track record of effectiveness. Consider that Nidal Hasan shot up an Army base in Fort Hood, Texas in 2009, where he was surrounded by people with guns who were highly trained to use them, but that didn’t prevent the shooting. In 1981, Ronald Reagan was surrounded by armed Secret Service agents who were highly trained to use guns, but this didn’t prevent him from getting shot. Clearly adding more guns to the mix doesn’t guarantee anything will get better. To get an even clearer picture of how ridiculous the “more guns” argument is, try applying the strategy to almost any other situation imaginable and see if it makes any sense. Is the response to a flu epidemic EVER more flu? Do you stop an ebola outbreak by spreading MORE ebola virus? Is the answer to severe air pollution EVER making and selling more cars and burning more coal? Was the answer to health problems posed by secondhand smoke in bars and restaurants adding MORE smoke to these places? If someone at your workplace gets seriously wounded in hazardous equipment, is the answer adding more hazardous equipment to the workplace? No! Of course not. It’s just common sense. The “add-more-of-the-problem” strategy doesn’t work with anything else on Earth. If as Ghandi said, “an eye for an eye leaves the whole world blind,” then adding another gun for every gun already in the U.S. will leave the whole country dead. In 2013, gun owners in America already had an average of eight weapons in their possession, and the U.S. had an average of one gun for every person in the country. In 2015, the total number of guns in the U.S. surpassed the number of people in the entire country. The U.S. has the most liberal gun ownership laws on Earth. If it were true that arming more people with more guns in more places more of the time would reduce gun violence, the U.S. would logically have the lowest rates of death and injury from firearms of any country. Instead, we have the highest. Above all, Republicans’ are WAY off the mark in their arguments about how to respond to gun violence. We need to be proactive, not reactive to this problem. The focus needs to be kept tightly on is preventing gun massacres from happening in the first place, not merely responding to them every time they occur. The only way to prevent gun massacres is to get the guns out of the mix. Guns are a public health problem. We MUST keep the focus on the fact that guns are the problem. So what are some proactive answers to rampant gun violence? The proposals people offered really made a lot of sense. Taken together, even just a portion of them enacted together could go along way towards starting to reverse the terrible predicament we’ve gotten America into with guns in this country. Put strict controls on the purchase of ammunition; track purchases and limit quantities that can be sold. Let the Centers for Disease Control gather data on deaths and injuries from firearms, and allow CDC to address the problem of gun deaths as a public health epidemic. Make gun owners document that they belong to a well regulated militia, in accordance with the Constitution, prior to purchasing a gun. All these measures make good sense. 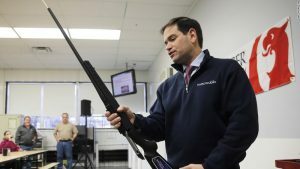 Taken together they could make a huge difference in the future of this country without affecting peoples’ right to own a gun as part of being in a well-regulated militia, which is the justification for owning guns in the Second Amendment. 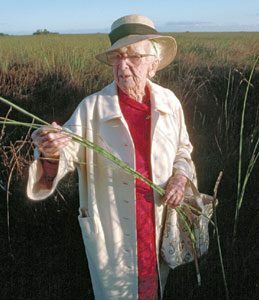 Marjorie Stoneman Douglas, the namesake of the Parkland, Florida high school that got shot up on Valentines Day, 2018 and that led to seventeen people being killed and the current movement to limit guns in the country, was a dedicated journalist and researcher who successfully fought efforts to drain the Everglades and develop the land commercially. Through her efforts, Stoneman Douglas helped people understand that the Everglades aren’t just a worthless swamp — they are a unique and invaluable environmental feature that is home to a host of highly unique wildlife and that helps mitigate flooding. Her influence has been compared to that of Rachel Carson, author of the highly influential book “Silent Spring,” that ushered in an era of environmental awareness and cleaning up of epic, huge environmental hazards wreaked on the country by government and businesses. Now students from Marjory Stoneman Douglas High School are trying to do something similar: make people see the importance of reining in America’s incredibly dangerous, irresponsible runaway gun culture. If they are successful, they stand to save countless lives in the future. Great article. It goes to the core, and that is that 2nd Amendment is far less important to the firearms manufacturers and the NRA than their profits. OMG, when will the madness end? Just look at the deaths caused by hostile, German delivery vans with semi-automatic transmissions? And from what I understand, they’re proliferating into the US as well. And they say the driver committed suicide with a gun. Now, that’s the kind of gun violence I’m talking about. Aim small, miss small. You’d have a hell of an argument there, if there was a history in this country of people going into schools and killing children with German delivery trucks. How many designated delivery van free zones are there in this country? So as you can see, there’s always the risk of a hallway, head on collision with a good guy, driving a German delivery van. How’s that for a good argument? It works for me. And have you become the designated, official voice, of Anne Landman? Oh, gud boy. It works for you because it’s a ludicrous argument. As for your obsession with Anne, that’s her issue to deal with, until you whine about wanting her to vouch for you again. “You whine”? Would that be like “screaming cry babies”? You better watch it there bub, lest you get yourself “blocked from further commenting”. And you know how you are? Actually, I was asking Anne (the other Anne), to validate her own assertions in her rant. Obviously, that’s not something you can do for her, having already admitted, in writing, that you don’t care that you have no credibility. Or maybe you consider that just a dog whistle? Did you come here to argue, or just complain? No, actually I came over to this site more or less to prove that Anne’s gun violence theory had a critical flaw, as it is based on the erroneous idea that inanimate objects, such as guns or hostile German delivery vans with semi-automatic transmissions, are capable of malice, and/or independent action to violence. But pretty much why bother? You’ve already done that for me. Just hold up the phone and tell Anne; I think it’s for you.. Atta boy. Where did she say inanimate objects had malice? “Don’t Be Fooled. Gun Massacres are about guns, not mental illness” Duh. No wonder you couldn’t find it, it was only the headline. Now, you’d better go ahead and get Anne like you were told, because you’re not doing so well on your own so far. But thanks for playing. Nothing in that title implies that guns have malice. Urban Dictionary; Duh; well thank you again capt obvious. Yes Anne, I know what it means. The question I actually asked you was why you used that word? The question goes to intellectual honesty. And I believe we just got our answer. Step back non believers. Jesus is coming, and boy is he pissed. I used the word because Republicans do the gun manufacturers’ bidding, like lackeys or servants. Was that unclear? No, but it is suspect, unless of course there is a complete suspension of all disbelief? Perhaps that’s the part that is missing from your equation? The human part. Because it sounds a lot more like you’re telling, than you’re asking. And what then? There are at least 4.5 million active members of the NRA. That’s a lot of lackeys. Wasn’t it George Armstrong Custer that said that…..last….? Or was it a lot of Lakota, he said? But either way works for me. You mean, the guys who are terrified of teenagers marching suddenly want people to be afraid of them? There’s really no group of warriors in history that you won’t try to appropriate, is there? Well, you’re half right. It is about who’s the real Comanche. Uh huh. And having Viking ancestry makes me Eric the Red. Wow Anne? Was your use of the word “lackey” in your rant meant to be demeaning or servile, in much the same way that Steve used “screaming cry babies”? Or would that be a subjective opinion? You know, sort of in the eye of the beholder? How fortunate that you hold the power to block speech you don’t like. But as for the guns, why don’t you just ban them all? And then go door to door confiscating weapons? And would you be doing that personally? Lackey is a another word for “servant,” AP.